Discussion in 'General Discussion' started by JWL, Oct 29, 2015. 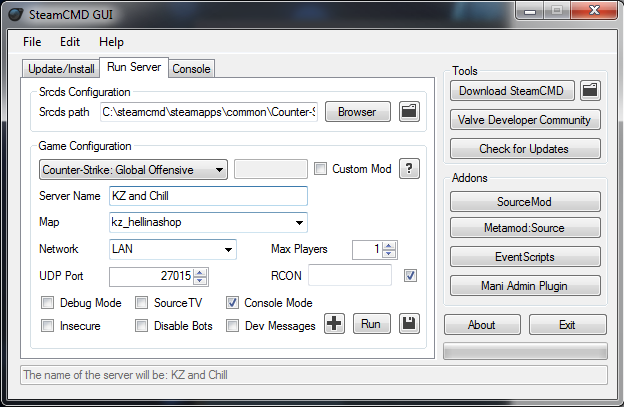 Download and Unzip steamcmd gui anywhere you want using something like PeaZip. Create a path/folder for your SteamCMD installation. I suggest just putting it in your Local Disc (C: Drive. 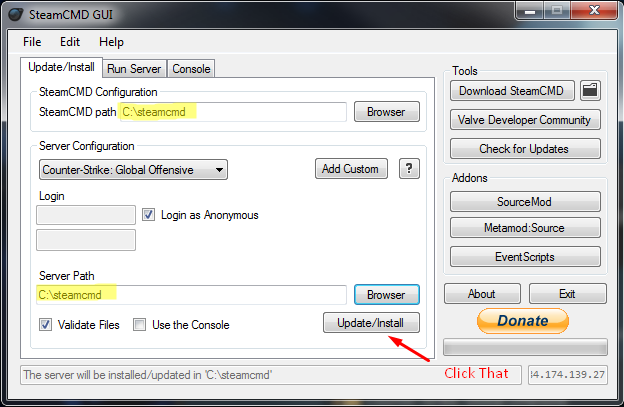 Download SteamCMD using the button towards the right of SteamCMD GUI. It will download steamcmd.zip to the your SteamCMD GUI folder. 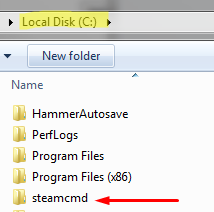 Unzip the file, and put steamcmd.exe in the steamcmd folder you created in #3. Next, configure the settings like so, and then click Update/Install. After Update/Install, it will come up with a simple command prompt looking interface. Don't touch anything, it's going to install a CS:GO server for you. Please be patient, it's going to take about a million years to download the ~8 GB of files unless you have 1GB internet like me. In the picture below, it's simply updating my local server. 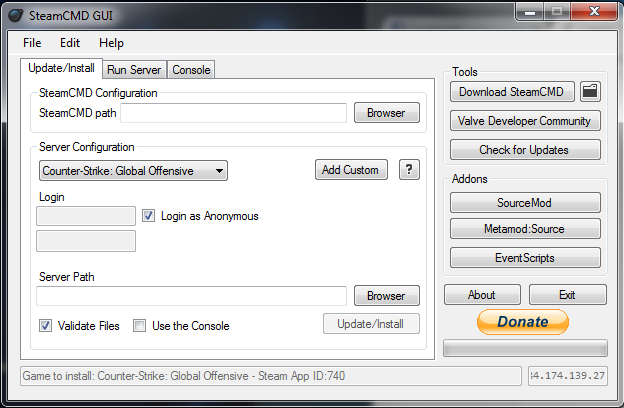 Remember this step, b/c it's how you update your local server every time a CS:GO Update rolls out to break the game. When it's done, it should say that the App was successfully installed. Feel free to close the window now. If you see this, then congrats! You've finished Step 1, and now have a local CS:GO server! I'm assuming you know where to find your local CS:GO server at this point. If you notice in steamapps/common/counter-strike global offensive beta - dedicated server/csgo, youll see this: Notice anything? You should, b/c I highlighted it. There's addons/cfg folders in your local CS:GO server installation and the sourcemod download you just unzipped. 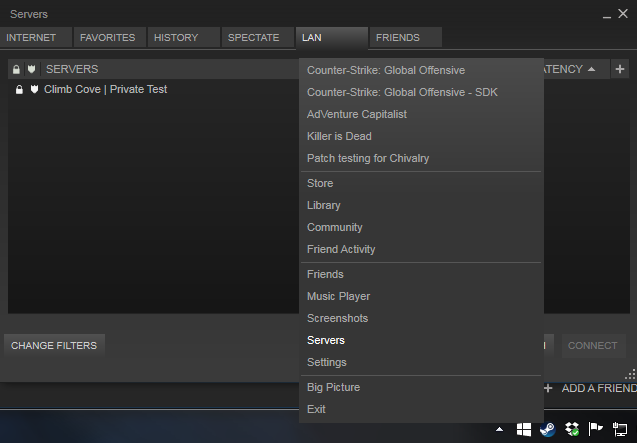 Simply highlight the addons/cfg folder from the sourcemod folder, and drag it to your csgo folder [of your server]. Make sure you're not dragging it in another folder. If it asks you to merge/overwrite anything, say yes. If it asks you if you want to delete system32, you probably downloaded sourcemod from the wrong link. Starting to see how easy it is to install stuff to a server? Just like you did with the sourcemod installation, drag and drop that addons folder to your csgo folder [of your server]. If it asks you to merge folders/overwrite anything, say yes. Congratulations you just installed Sourcemod/Metamod! Download and Unzip KZTimer Global [download link at top]. As you might have guessed, all you gotta do is drag/drop all these folders/files into your csgo folder [of your server]. If it asks you to merge/overwrite any files, say yes. Yes, that was it. You just installed what took thousands of hours of work in thousands of lines of code in some offbeat language called SourcePawn that looks kinda like Java but doesn't really but tries to act like java but doesn't really. My god my grammar was bad in that last 'sentence.' Anyway, congrats! You now have KZTimer installed/enabled on your local CS:GO server. Don't go trying anything yet though, we're far from done. Usually, you would need to manually edit databases.cfg in your sourcemod folder and paste a bunch of lines in to setup your KZTimer database. However, for the sake of simplicity, I have already done so in the file you just downloaded. Drag that sucker over to csgo/addons/sourcemod/configs. It will ask you if you want to overwrite the existing databases.cfg. Say yes. Congrats, you've setup your KZTimer database [stats], and KZTimer Global is now completely installed and activated. Remember that CFG Files folder you downloaded? Like... 30 seconds ago? 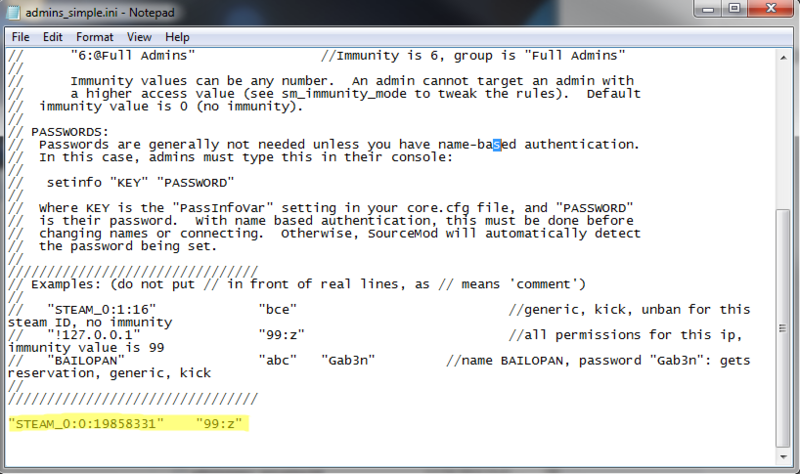 Yea, so in it are two files: admins_simple.ini and server.cfg. I've pasted a sort of copy of the server.cfg I use for my local kztimer server. Open it up: These are the 3 things you need to worry about. The rest of it is just a bunch of mumbo jumbo that's already there. hostname is the name of your server. rcon_password is the password that is used to do modify things within your server. Try to make it something better than 'asdf.' sv_password sets the password of your server. This is completely optional, and even unnecessary if you run your server on LAN mode/don't open ports on your router. 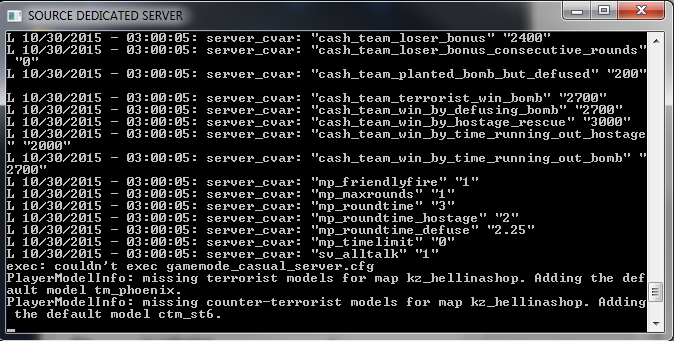 Drag your configured server.cfg to csgo/cfg. Say yes to overwriting the existing one. If you're wondering what "99:z" is: 99 is your immunity level. It's your power level in the server. Don't write 9000, just go up to 99. Z is your 'admin flag.' It's basically the level of permissions you have in the server. Z is for root permissions. Only give yourself flag 'z'. Save the file, and drag the configured admins_simple.ini to addons/sourcemod/configs. Congratulations, you have now setup your server name, and made yourself admin (or maybe some lucky stranger)! I am not going to go over how to install maps [.bsp and .nav files] or workshop maps. There are already plenty of guides written on this. If you would like to understand how to use the workshop maps system with KZTimer, click here. 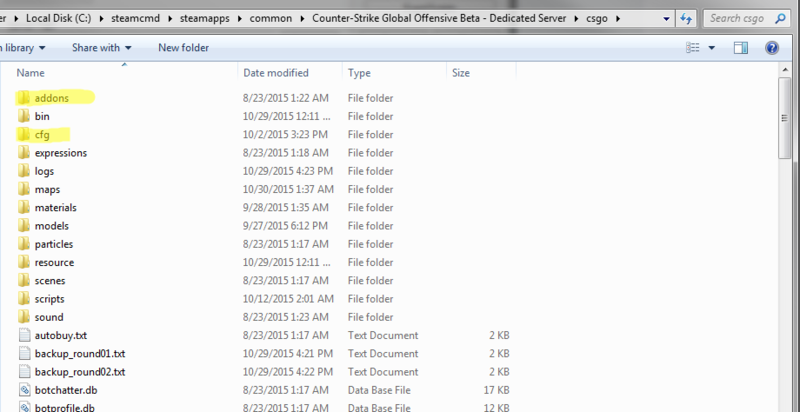 If you have no idea: maps go into csgo/maps folder and workshop maps go into csgo/maps/workshop folder. Simple as that. SerenityJayne, FrOzeN, Nthng and 13 others like this. If you are running your local server locally on another local computer, then you'll want to locally start CS:GO locally first. If you locally start a CS:GO Dedicated Server locally before starting your CS:GO game client locally, it will locally consider the game already running... locally. So yeah, start your game first. - [Network] LAN for just you. Internet if you want your friends to be able to join (but you'll need to do some other steps too). - [UDP Port] Just leave it at 27015. Occasionally your server will randomly pick a port between 27015-27017. Don't ask me why. - [Max Players] I suggest 1. Then again, this setting doesn't seem to work. Now we're going to set your command line options of the server. To do so, press the '+' by the Run button. Here are some useful command line options. You can add multiple ones by separating them with a space. After you have configured your command line options. Press Enter, and the 'Custom Commands' box will go away. 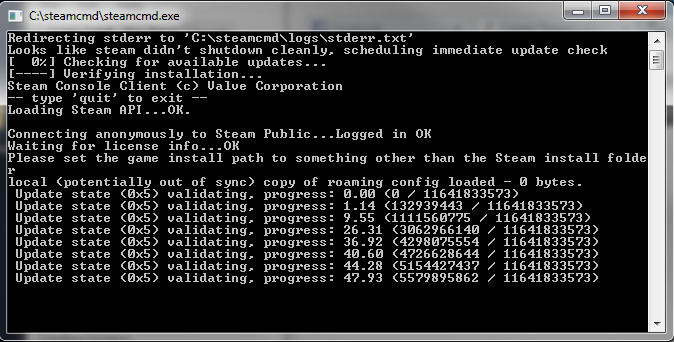 In SteamCMD GUI, go to File -> Save. It'll ask you to save Config.xml. Do it. What you just did was save your settings for SteamCMD GUI. When you open SteamCMD GUI back up. Just go to File -> Load, then click on Config.xml, and it will load your settings. [OPTIONAL] I am not going to cover port forwarding in this guide as it's different for every router. However, I am going to give you a list of the ports you'll want to forward if you want other people to be able to join your server. Congratulations, you have completely setup your server, and you're now ready to press the Run button. To find/connect to your server easily. Right click on the Steam icon in your dash tray. Click on Servers, and go to the LAN tab. FrOzeN, Nthng, Heinzelboss and 16 others like this. How can i let a server (wether if its bought from a website/hoster or locally hosted on my PC) run a whole steam workshop list e.g. the approved KZtimer list? I've been trying to configure my server to start maps with an mp_freezetime so that I can record demo's without them being all choppy (for some reason if you don't start recording a demo during freezetime it ends up with like 10 fps). I've changed every config file's mp_freezetime value to 60, yet there's still something overriding it to 0.00000 everytime I change maps, is this deeper than the config files and somewhere in the coding of the plugin? Instead of doing that, take these steps to record a fluid demo in any KZTimer server. Type "retry" in console to reconnect to the server. This will also stop your demo. The demo should be smooth as any other.